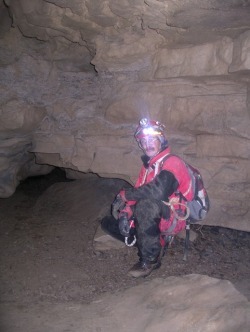 My son Luke and I arrived at the entrance of Rumbling Falls Cave around 10:30am. A car was parked in the quarry parking lot with Tennessee tags and another car was arriving at the pull-off at the same time we were. The two guys in this car were from Indiana and were just planning on checking out the entrance and dropping the warm-up pit. They were not planning to drop Stupendous Pit that day since they needed to return home. After gearing up, Luke and I entered the cave around 11:00am(?) and Luke rigged the 70-foot drop. 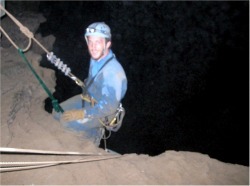 Luke rappelled first and then I followed, carrying the 250-rope that would be used to drop Stupendous 1 ½ hours later. At the bottom of the drop we traveled upstream through a canyon passage that quickly got narrower and smaller. After a few hundred feet we reached the first climb-up… a 15-foot waterfall, which we free-climbed. Shortly after that we came to a second waterfall climb. 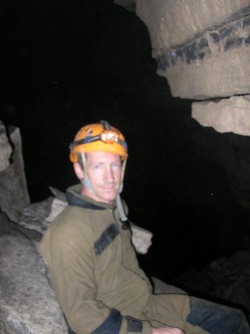 There was a rope already rigged that Luke used to climb and then traverse horizonally across the canyon. I chose to free-climb this waterfall as well. It was wet, but stable. Yet, as I was climbing up I knew that upon returning later that day I’d probably be using the rope to traverse and rappel. A couple hundred feet beyond the two waterfall climbs the passage gets more difficult… hands-and-knees crawl… belly crawl… very narrow and long canyon passage, etc. It was at this point we caught up to three cavers from Chattanooga: Ralph Powers, John (WildWolf) and John (Caver86). It was their car that we had seen parked at the quarry that morning. Together, the five of us worked our way and pushed/pulled our packs and ropes through the tight passages. Then, the passage disappeared! No more ceiling. No more walls. And most impressively… no more floor. We were at Stupendous Pit. 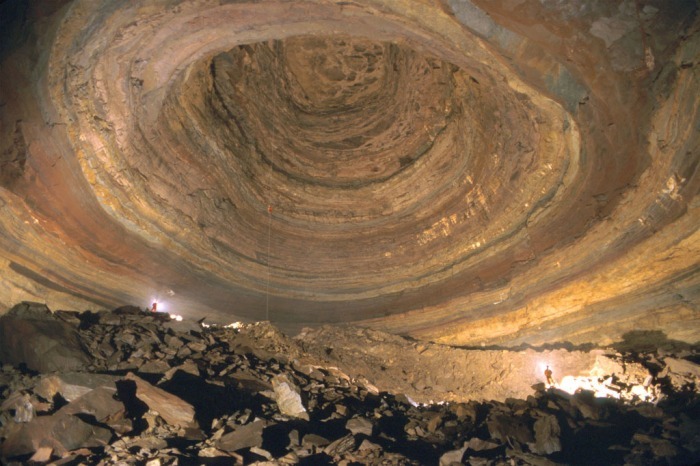 Stupendous is certainly not the deepest pit in a Tennessee cave, but definitely is one of the more impressive ones. 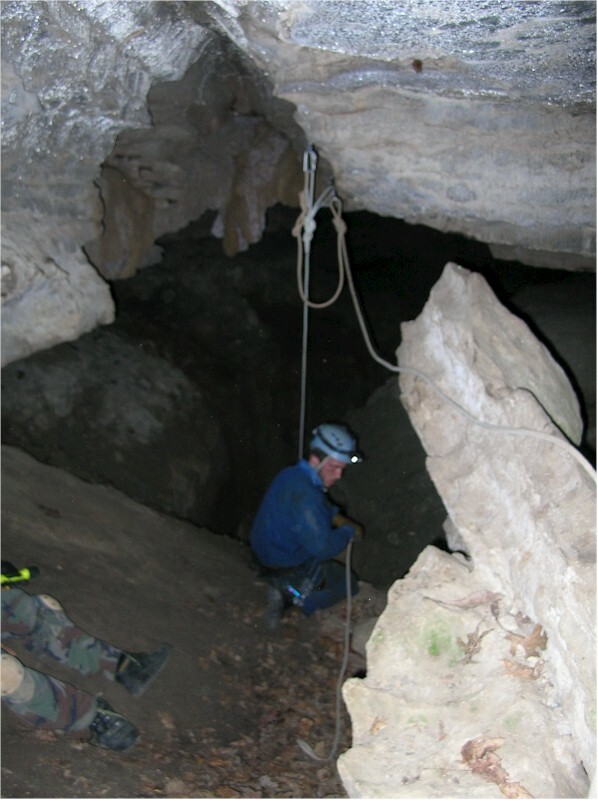 It descends into the second largest cave room in the United States. The Rumble Room. The Catt.-boys rigged their rope from the closest set of bolts and we rigged ours from a second set of bolts farther out along the pit’s edge. We alternated rappelling. WildWolf went first off their rope. Luke went second off our rope. 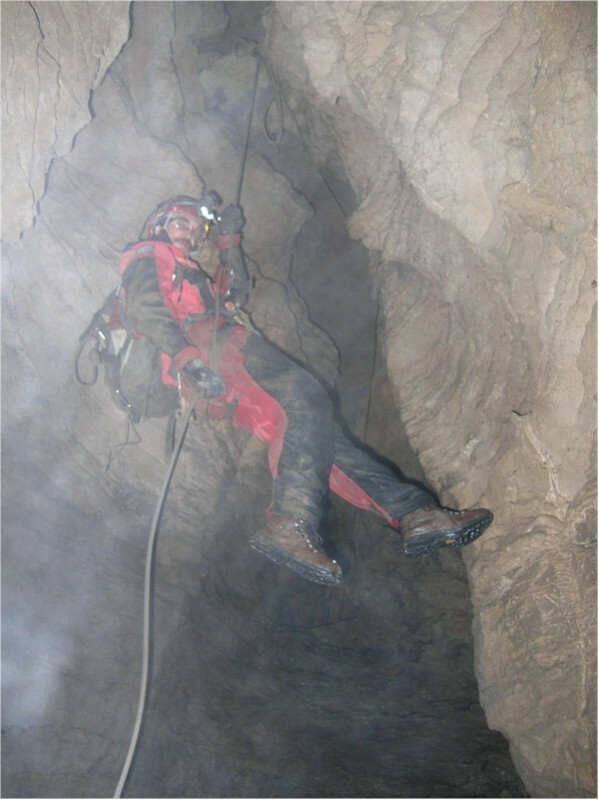 Then Ralph, me and finally Caver86. 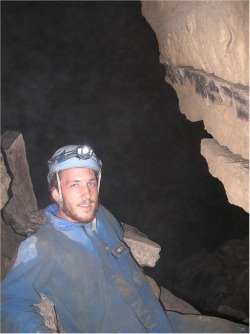 We all spent some time at the bottom of the 201-foot rappel. Amazing! What enormity and vastness! We all roamed around the room. 86 and I went down into the river passage which lies at 336-feet below the entrance and no telling how far below the surface directly above. Rumbling Falls is now mapped at 16.01 miles. Needless to say, we saw very little of it this time around, but what we did see will always be remembered. The return trip out was uneventful. We reached the surface somewhere around 5pm.